There is certainly no shortage of books about the Deepwater Horizon disaster: at least eight by my count, and nine if you include the 300-page package of recommendations that the National Oil Spill Commission put out earlier this year (which you can buy on Amazon for about $40). Many of these books were published just in time for this week’s first anniversary of the spill, and several of them managed to make it to my desk. I’d like to say I read every last work of every one of them, but, well, they’re all pretty long and I’ve both read and written quite a bit about the disaster. I wish I could say, “If you were going to read just one book on the oil spill, it should be X,” but frankly each of these books offers pretty different takes on the same explosion and ensuing nightmare. 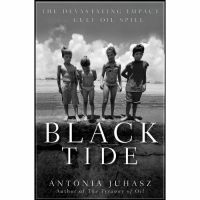 Antonia Juhasz’s Black Tide: The Devastating Impact of the Gulf Oil Spill surveys the overconfidence in safety and technology that led to the situation on the Deepwater Horizon and the scale of the disaster it unleashed. Juhasz, who directs the energy program at the environment and human rights group Global Exchange, talks to the families of the victims of the explosion, combs through accounts of the survivors, and pulls together many of the strings of the story of what really happened on April 20 in a way that’s both engaging and informative. As her 2008 book The Tyranny of Oil would suggest, Juhasz is certainly no big fan of the oil industry. And her criticism is pretty scathing, if not undue. While it has a lot of important information, hers is not the most compelling narrative; it could benefit from some more literary flow and story-telling. Some of her descriptions of people and places a bit clunky and strained. It’s an engaging read overall though. 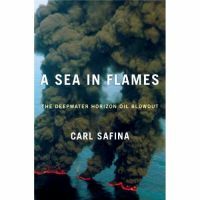 Noted conservationist and writer Carl Safina’s offering on the Gulf disaster, A Sea in Flames, is a passionate and detailed account of both the explosion and the giant mess that unfolded over the ensuing months. He expends a good deal of effort explaining things like exactly how drilling works in vivid detail. Having spent a lot of time trying to understand this kind of thing myself, I can only imagine that for him, writing the book was also an exercise in trying to better understand what exactly happened. Safina’s book is best at the points where he does not remove himself from the story. It’s most telling moments are when he expresses the frustration and sadness that many who lived through the spill must have been feeling. And one point he recalls trekking across beaches on June 8, which is World Ocean Day. “I’m having a bit of a hard time, emotionally speaking, with that,” he writes. No kidding. Also telling is Safina’s exploration of what exactly went wrong in the administration’s handling of the spill. It’s a question that has bothered me greatly; the Obama administration has pledged to uphold science and has appointed a number of truly great scientists, yet some of the things that happened in the months following the spill were truly horrifying. Safina pays particular attention to Jane Lubchenco, the noted marine ecologist and current head of the National Oceanic and Atmospheric Administration, whose handling of both the undersea plumes of oil and the report on where the oil went drew fair criticism. Safina has worked with Lubchenco closely in the past, so his take on the of the pressures the administration faced in dealing with the politics of the spill—the fact that they did not do a particularly good job of it in many regards—is quite interesting. Safina’s writing has many elements that seem more like something jotted in a notebook than thoughts fleshed out for a narrative. At times it’s useful, but more often it gets a little grating. Also tiresome is his use of the initials “BP” to make points throughout the book, which gets stretched at times—Big Paycheck, Beyond Payable, Big Pressure, Breaking Point … you get the idea. 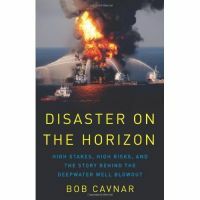 For more of an industry insider’s take on what went wrong, I recommend Bob Cavnar’s Disaster on the Horizon: High Stakes, High Risks, and the Story Behind the Deepwater Well Blowout. Cavnar, who blogs at the Daily Hurricane, spent more than 30 years in the oil and gas industry. His is the perspective of someone who understands the cultural and political elements of offshore drilling, but he also delivers the criticism it deserves. He is also able to maintain realism about both the problems of oil dependence and the logistical challenge of getting off petroleum any time soon. Cavnar offers a thorough examination on the regulatory system that allowed this disaster to take place, and of the revolving door and close relationship between industry and the government that developed over the years. The portion of the book devoted to where we should go from here left me wanting a bit. Given that nothing has really changed in terms of policy and politics on the issue in the past year, A more detailed look at what should and can be changed would have added to the conversation. A few other books out there on the topic that I haven’t yet been able to check out: Fire on the Horizon: The Untold Story of the Gulf Oil Disaster, by Tom Shroder and John Konrad; In Too Deep: BP and the Drilling Race That Took it Down, by Stanley Reed and Alison Fitzgerald; In Deep Water: The Anatomy of a Disaster, the Fate of the Gulf, and Ending Our Oil Addiction, by Peter Lehner and Bob Deans; Blowout in the Gulf: The BP Oil Spill Disaster and the Future of Energy in America, by William Freudenburg and Robert Gramling; and Drowning in Oil: BP & the Reckless Pursuit of Profit, by Loren C. Steffy.